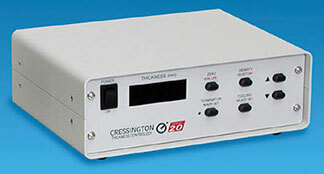 The 208HR High Resolution Sputter Coaters from Cressington offer real solutions to the problems encountered when coating difficult samples for FESEM imaging. FESEM applications need extremely thin, fine-grained, uniform coatings to eliminate charging and to improve contrast on low density materials. In order to minimize the effects of grain size the 208HR offers a full range of coating materials and gives unprecedented control over thickness and deposition conditions. The 208HR Turbo Pumped High Vacuum System offers a wide range of operating pressures allowing precise control of both uniformity and conformity of the coating, minimizing charging effects. 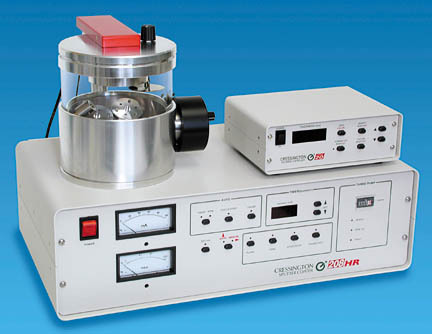 The HIGH / LOW chamber configuration allows easy adjustment of the distance from target to sample. The MTM-20 High Resolution Thickness Controller has a resolution of better than 0.1nm. This enables precise and reproducible thin coatings, especially in the range of 0.5 - 3nm, a thickness desirable for FESEM applications. The 208HR system is available in a number of configurations to enable to deliver the best high resolution coatings for your applications. 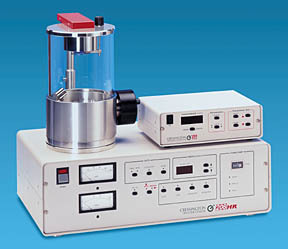 The208HR can be supplied with a standard rotary backing pump or a dry scroll pump for clean room applications. The standard 208HR includes both Chromium and Platinum/Palladium as target materials. There is also a 208HR Iridium including an Iridium target providing excellent fine-grained coating for high resolution FE-SEM imaging on a wide variety of samples. Wide choice of Coating Materials. Magnetron head design and effective gas handling allow a wide choice of target materials. Precision Thickness Control. Thickness optimized for FESEM operating voltage using the MTM-20 High Resolution Thickness Controller. Multi-angle Stage Movements. Separate rotary, planetary and tilting stage movements ensure uniform coating with excellent conformity, even on highly topographic samples. Multiple Sample Holders. Four sample holders are provided with options to accommodate sample sizes as large as 32mm diameter. Variable Chamber Geometry. Chamber geometry is used to adjust deposition rate to optimize structure. Wide Range of Operating Pressures. Independent power and pressure adjustment allows operation at argon gas pressure range of 0.2 - 0.005 mbar. Compact, Modern, Benchtop Design. Space and energy saving design eliminates need for floor space, water or specialized electrical connections. Ease of Operation. System operation and setup is very similar to standard sputter coating and does not require additional cleaning compared to ion beam coaters. 208HR coating system with 150mm diameter chamber , 165 - 250mm variable height. Magnetron sputter head, shutter, Cr & Pt/Pd target or Ir target standard. Optional targets available are: Ag, Au, Au/Pd, Cr, Cu Fe, Ir, Mo, Nb, Ni, Pd, Pt, Pt/Pd, Ta. Sputter supply with full microprocessor control and digital independent current control. Pumping system with turbo drag / rotary pump combination, producing a fast pumpdown desktop system with all metal coupling and anti-vibration table for rotary pump. Optional dry scroll pump available for cleanroom applications. Integrated turbo molecular drag pump ensures fast pump down combined with high positive pumping speed during sputtering process. The complete High Resolution Sputter Coater 208HR is a complete solution and includes: pumping system, Thickness Controller MTM-20, Rotary-Planetary-Tilting sample Stage with 4 sample holders, Cr & Pt/Pd targets or Ir target. 8000 208HR High Resolution Sputter Coater for FESEM, 115VAC, 50/60Hz, Cr and Pt/Pd target each P.O.R. 8002 208HR Iridium coater for FESEM, 115VAC, 50/60Hz, Ir target each P.O.R. 8004 208HR High Resolution Sputter Coater for FESEM, Dry-Pumping System, 115VAC, 50/60Hz, Cr and Pt/Pd target each P.O.R. 8008 208HR Iridium coater for FESEM, Dry Pumping System, 115VAC, 50/60Hz, Ir target each P.O.R. 8000-220 208HR High Resolution Sputter Coater for FESEM, 220VAC, 50/60H, Cr and Pt/Pd target each P.O.R. 8002-220 208HR Iridium coater for FESEM, 220VAC, 50/60Hz, Ir target each P.O.R. 8004-220 208HR High Resolution Sputter Coater for FESEM, Dry-Pumping System, 220VAC, 50/60Hz, Cr and Pt/Pd target each P.O.R. 8008-220 208HR Iridium coater for FESEM, Dry Pumping System, 220VAC, 50/60Hz, Ir target each P.O.R.